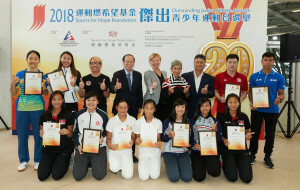 Organised by the Hong Kong Sports Institute (HKSI), supported by the Sports Federation & Olympic Committee of Hong Kong, China (SF&OC) and the Hong Kong Sports Press Association (HKSPA), the Sports for Hope Foundation (SFHF) Outstanding Junior Athlete Awards celebrates its 20th anniversary this year and the presentation ceremony for 1st quarter of 2018 was held at the HKSI today. A total of 8 junior athletes were presented the Award for their excellent performance and a lighting ceremony was staged to mark the beginning of the 2018 awards. 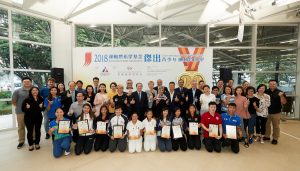 The awardees were Vivien Chiu and Lee Sze-wing (Cycling), Hsieh Sin-yan and Ma Ho-chee (Fencing), Chau Wing-sze (Table Tennis), Leung Pui-hei (Windsurfing), and Chan Yui-lam and Hui Ka-chun (Swimming – Hong Kong Sports Association for Persons with Intellectual Disability). 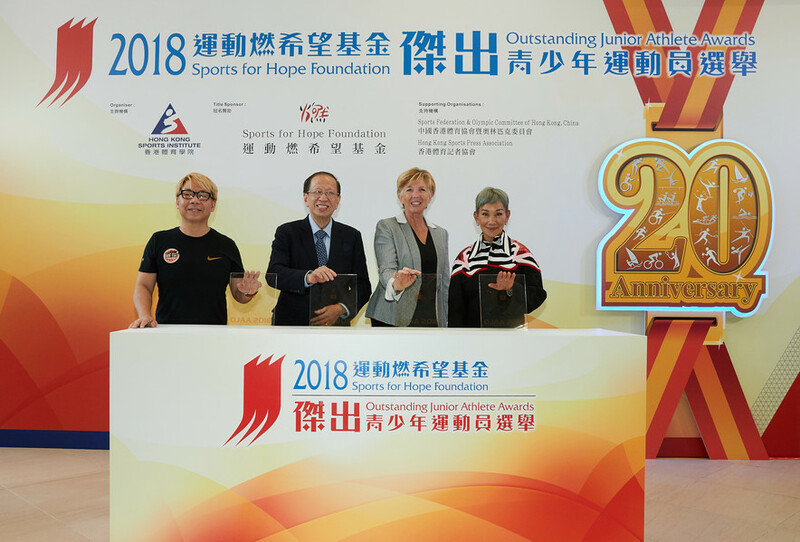 Officiating guests included Miss Marie-Christine Lee, founder of the SFHF; Mr Pui Kwan-kay SBS MH, Vice-President of the SF&OC; Mr Raymond Chiu, Vice Chairman of the HKSPA; and Dr Trisha Leahy BBS, Chief Executive of the HKSI. Hsieh Sin-yan was awarded the OJAA title after claiming champion in the Women’s Epee (Cadet) event at the World Junior and Cadets Fencing Championships 2018. “Being the first Hong Kong Epee fencer to crown at the World Asian Junior & and Cadets Fencing Championships is a moment that I will never forget. Moreover, this is the last year that I can play in the cadet. I was not thinking too much at the competition, and my goal was to fence the best that I could in each match,” said Hsieh. The Asian Games and the Youth Olympics will be her target this year. 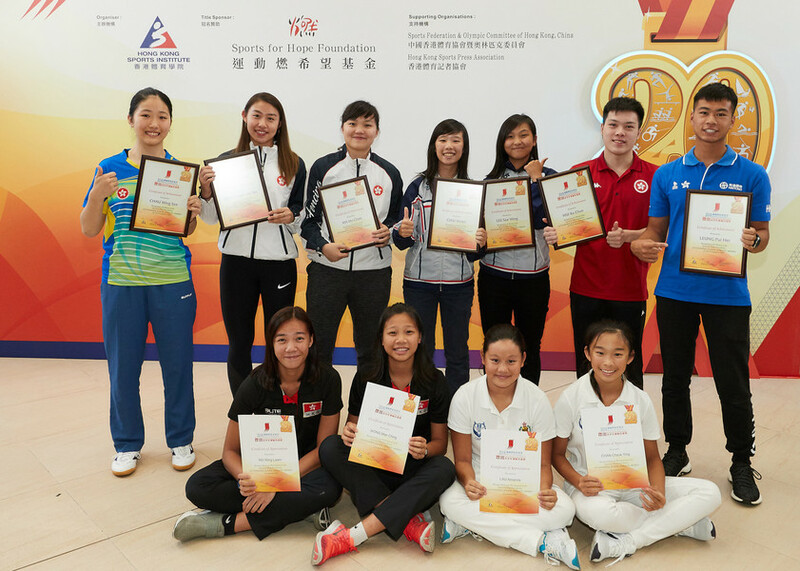 In addition, Wong Hoi-ki and Wong Hong-yi (Tennis) were awarded the Certificate of Merit for this quarter. Ng Wing-laam and Wong Man-ching (Beach Volleyball), and Chan Cheuk-ying and Amanda Lau (Finswimming) were presented with the Certificate of Appreciation to recognise their hard work. 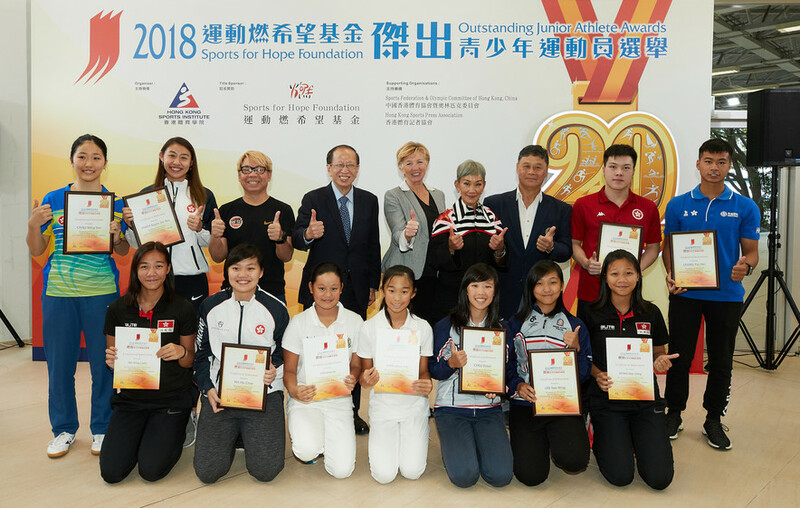 Organised by the HKSI and sponsored by the SFHF since 2012, with support from the SF&OC and the HKSPA, the OJAA recognises the achievements of outstanding local junior athletes under the age of 19 on a quarterly basis. 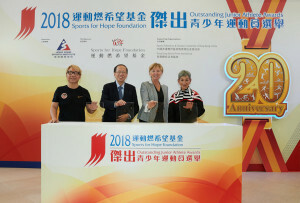 Each recipient is presented with a cash prize of HK$2,500, a sports voucher worth HK$2,500 and a certificate. For teams, they will receive a cash award of HK$10,000, a sport voucher worth HK$10,000 and certificates.